Dolma or Tolma? This name of this dish has led to more than a few heated disputes. Photo (c): Vitaly Arutyunov / RIA Novosti. All rights reserved. Is the popular dish consisting of vine leaves stuffed with rice and/or meat called dolma or tolma? You may think this is a purely culinary question, but you’d be mistaken. Presidents, politicians, ministers, community organisations and the media are all engaged in a heated debate over the preparation of tolma/dolma in the South Caucasus, and particularly in Armenia and Azerbaijan. The conflict over Nagorno-Karabakh has hit the kitchens. “The aim of the festival is to popularise traditional Armenian dishes and the idea of tolma as part of our national cuisine, contrary to the received opinion that it has Turkish roots. After our organisation held its tolma festival, which was reported on CNN, the Azerbaijanis fell silent – we had dealt them a knockout blow”. While no one argues about what country a national anthem or flag belongs to, there is no consensus on the provenance of certain kinds of food. The debates over the “nationality” of dishes had been developing over many years before the outbreak of the “tolma war”. A rise in ethnic consciousness, an overemphasis on national culture and issues around national identity and anything that might threaten it are all hangovers from the colonial (in this case, Soviet) past. In the Soviet years, cookbooks based on regional cuisines defined the borders of their cultures and encouraged culinary nationalism. Cookbooks, as structured collections of the directions post-Soviet dining should take, have become the main weapons in the South Caucasus culinary wars. It is true, though, that while no one argues about what country a national anthem or flag belongs to, there is no consensus on the provenance of certain kinds of food. Today’s conflicts provide a multitude of examples of culinary wars in areas with unresolved border issues. One of the best known and most studied regions in this context is the Balkans, where disputes over its Ottoman legacy are still active. And there is the more recent example of the “hummus wars” being fought between Arabs and Israelis. An analysis of Armenian-Azerbaijani culinary clashes shows that this conflict itself is leading to an exacerbation of the spilt in national gastronomic traditions, where each side insists that it has the historic right of “ownership” of a given dish. In 2011 I began looking at the Armenian-Azerbaijani national food war and received a grant from the South Caucasus branch of the Heinrich Böll Foundation to pursue my research further. I began to realise that culinary wars also have their own rules for attack and defence, as well as their generals and troops and, depending on the outcome of their battles, dishes that have fallen on the field of battle or been taken prisoner. 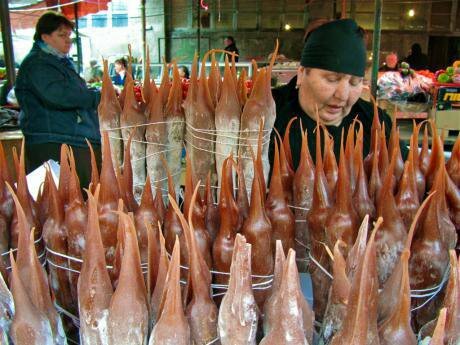 The South Caucasus culinary wars have been going on for many years and on all fronts. 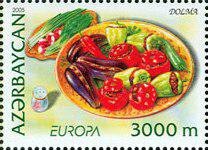 In 2011, for example, on the eve of a visit to Armenia by the then President of Georgia Mikhail Saakashvili, there were articles in the press about Georgia-Armenian “culinary appropriations” and mutual recriminations. Their headlines themselves reflected their subjects: “In Yerevan, will Saakashvili try to stand up for khachapuri cheese bread and Saperavi wine?”, “Will Saakashvili discuss the questions of churchkhela [a traditional sweet of nuts encased in a dried fruit paste – ed.] and khachapuri?” and so on. 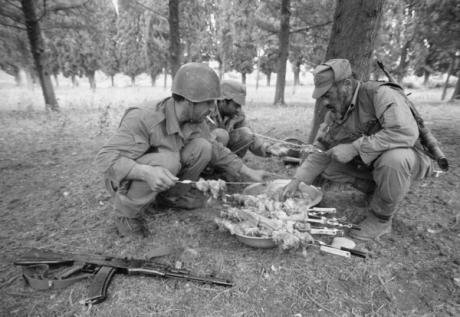 Armenian soldiers prepare kebabs near the frontline in Martakert Region. Nagorno-Karabakh, 1992. Photo (c): R. Mangasaryan / RIA Novosti. All rights reserved. In this case the Georgian-Armenian conflict was more about brand names and marketing, as well known delicacies were involved – Georgian varieties of wine and churchkhela, which is popular in both Armenia and Georgia. And in general, Georgian-Armenian culinary arguments are sporadic and rarely go beyond media altercations (and chiefly on social media at that). On the Armenian-Azerbaijani gastronomic front, passions are more unbridled, and have long since strayed into the real political arena. In Azerbaijan, the war is waged directly from government offices, while in Armenia the media and the third sector are mainly focused on their neighbour’s “culinary appropriations”. Azerbaijan, for example, has a “National Culinary Centre”, whose CEO Tahir Amiraslanov actively promotes publications devoted to Azerbaijan’s national cuisine and an analysis of alleged Armenian pretentions and takeover attempts in the culinary sphere. His organisation, which receives government funding, publishes material accusing the Armenians of stealing Azerbaijan’s national cuisine. He told one interviewer that “Since 1989, the issue of Armenian pretentions towards Azerbaijan’s culinary traditions has been discussed at the highest level, by specialists and academics, many times. Every pan-Turkish, Islamic dish, including those from Azerbaijan, is claimed as Armenian – they are trying to prove that an Armenian culinary tradition exists. Meanwhile, Armenia is busy working out a defence. There are a number of forces engaged in this exercise: its “Society for the Preservation and Development of Armenian Culinary Traditions”; its academic community, represented by both nutricians and ethnographers, and its media, which often fuel public demand for incisive debates on the “ Armenian-ness” of various dishes. The main dishes affected by the culinary wars are those with a clearly symbolic ethnic significance: tolma/dolma, lavash [flatbread], harisa [a thick, meaty porridge], kofta [meatballs], pahlava [a sweet dessert based on filo pastry] and other dishes with a ritual or celebratory history. The tolma/dolma dichotomy is still at the centre of gastro-nationalist discussion in both Armenia and Azerbaijan. The involvement of well known international cultural heritage organisations such as UNESCO has intensified the zeal on both sides. Azerbaijan’s Ministry of Culture, in answer to “Armenia’s attempt to lay claim to lavash”, in 2016 fired off a request to UNESCO (entitled “The culture of the preparation of dolma and its classification as a marker of culture identity”) to have the dish included in the organisation’s intangible cultural heritage list. The request will be considered by UNESCO at its meeting in November. Churchkhela at a bazaar in Tbilisi, the Georgian capital. This traditional delicacy is prepared by pouring grape syrup over a string of walnuts and leaving it to set. Photo CC-by-4.0: Gabriella Opraz / Flickr. Some rights reserved. Meanwhile, Armenia has been celebrating its annual tolma (not dolma) festival. It is telling that the choice of location for the festival always has a symbolic significance. The first one, in 2011, took place at the Sardarabad memorial complex – the site of a battle in 1918 that halted an attack by Turkish troops and laid the foundation for the independent, and short-lived, Democratic Republic of Armenia. “This is a place that symbolises self-defence”, Sedrak Mamulyan, one of the festival organisers, said in an interview. “Our national cuisine is where we can develop this self protection. It’s is among the oldest and most famous in the world, and acted as a donor for our neighbours: all our neighbours have adopted Armenian dishes”. In 2017, Armenia’s Ministry of Culture chose the village of Hnaberd, near the site of the country’s medieval capital Dvin, as the venue for the tolma festival. Chefs prepared a 60 metre long tolma (the usual length is 10cm), while bands and dance groups in national costume entertained the public – the festival is a hit with locals and tourists alike. Pastry cooks also constructed a model of the ancient Temple of Garni (the only standing Greco-Roman colonnaded building in the former Soviet Union); Mount Ararat, sacred to Armenians although situated in modern Turkey; the fertile Ararat valley and other historical symbols – all out of tolma. And they also demonstrated their expertise by combining tolma with another “conflicted” dish – the kebab. 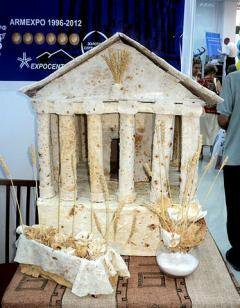 A model of the ancient temple of Garni, Armenia, made of Lavash. ArmExpo, Yerevan, 2013. Photo CC-by-2.0: Armine Aghayan / Wikimedia Commons. Some rights reserved. Why is it dolma/tolma, lavash and harisa porridge that have become the symbols of national discord? It is because they represent territorial aspirations: as the tolma festival organiser explains, “The roots of an indigenous people and their right to the territory they occupy is inextricably linked with their national cuisine. And tolma is a typical dish of a settled, and therefore indigenous people”. How, then, can you disprove national belonging through food? The Armenian side’s main argument is that to make tolma you need vine leaves, which is evidence of early agricultural development: there is also clear archeological evidence for viticulture and wine-drinking in ancient Armenia. Another stumbling block for the Azerbaijani side in this context is the fact that dishes based on wheat are a sure sign of cereal production, which in its turn points to a settled people. The thick, meaty porridge harisa is a very popular dish in Armenia (a similar dish known as keshkek is widely eaten in Turkey). 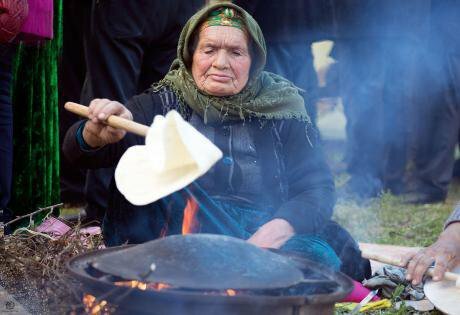 An elderly woman prepares Lavash. Azerbaijan, 2014. Photo CC-by-4.0: Elxan Qəniyev / Flickr. Some rights reserved. Debate on the way lavash is baked in a “tonir” – a clay oven sunk into the ground – has provoked arguments (link to Russian language site) around territorial rights: “Lavash was only ever baked in a tonir, and a tonir is a characteristic of a settled society, but not of a nomadic one like the Turks”. Discussions like this on the culinary-political claims of their neighbours can end up looking like direct threats to Armenian indigenous identity: “the next thing will be claims that the Turks always used tonirs” (link to Russian language site). In 2015, another discussion on the “takeover” of lavash by the Azerbaijani side – as part of a multi-national request to UNESCO to recognise traditional flatbread – drew attention yet again to the contrast between settlement and nomadism, seen by Armenians as a lower stage of development. The main thrust of the Armenian media discussions was that Turks and Azerbaijanis only sought to claim the dishes of “settled” societies, apparently showing how keen they were to conceal their nomadic existence”. These debates echo a developmentalist tradition of demonstrating a settled population’s apparent superiority over a nomadic one – a mode of thinking which developed in the pre-Soviet and Soviet periods. State’s policy boiled down to an official adoption of this position. Nomads, as a rule, were seen as “destroyers of advanced civilisations” – hence evidence of ancient agricultural development is cherished by nationalists on both sides. It is hard here to avoid quoting the famous anthropologist Mary Douglas: “national food cultures become a blinding fetish which, if disregarded, may be as dangerous as an explosion”. Tolma or dolma – these forms are also not just variations on a single word, but a long road back into history, and another turn in the discussion about settlement and nomadism. Back in the 1960s, the historian Suren Yeremyan, studying the origins and development of Armenian food culture, was already looking at early settlement and agricultural practice in Armenia through the meaning of the word “tolma”: “In Armenia we can still find wild grape vines, known as ‘toli’ (from the Urartu ‘uduli’ – grape), and many are still producing fruit”. The word “uduli” was chosen as the name of the annual tolma festival because it was a good fit with the philosophy behind the event: to show Armenian cuisine as authentic, ancient and the result of unbroken cultural continuity. In contrast, Azerbaijani sources point to words of Turkic origin: “the name dolma comes from the Turkish verb ‘dolmag’, which can be translated as ‘to fill up’”. There is a clear link between the Turkish version of the word and the way the dish is made. The Azeri language also contains the verb ‘dolamag’ – ‘to roll up’. Our dolma. Postage stamp from Azerbaijan. Photo CC: H. MIrzoyev / Azermarka. Some rights reserved.It can also, however, be used in the context of making dolma, as Tahir Amiraslanov of Azerbaijan’s National Culinary Centre explained while discussing a book about Armenian cuisine (link to Russian site). 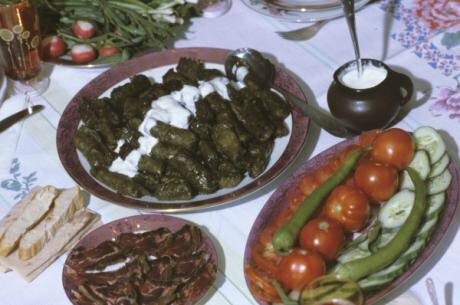 These discussions are repeated, almost word for word, on media platforms and in forums, where there are passionate discussions about the “authentic” way of preparing the dish: the tolma is a rice and/or rice mixture wrapped in vine leaves, whereas the dolma is vegetables stuffed with a similar mixture. The Nagorno-Karabakh conflict has certainly left its mark on the development of a discourse around food in both Armenia and Azerbaijan. The present Armenian-Azerbaijani food wars are the legacy of an indigenous, historical, linguistic and cultural continuity. They continue a process of incorporating the past into the present – though tastes and smells of which the very mention evokes strong sensations.